Once again, arbitrarily putting volume as volume 7. This was made possible in cooperation with my partner LivelyScans. There's also something I'd like to make clear to everyone. Most people just skip by the credits page, but if anyone does take a look, you'll notice that sometimes I am not listed as the translator(s) (I'm "pknoctis" if you didn't know). This is the case for chapter 25, and this means that the chapter was in Chinese. I cannot speak or read Chinese unfortunately, and I couldn't find any Japanese raws for this chapter, so we used a Chinese translator for this chapter (Zinion). Thus I cannot vouch for the accuracy of these translations (translated from Japanese to Chinese to English is rarely completely accurate). MOST of the time however, I have Japanese raws. 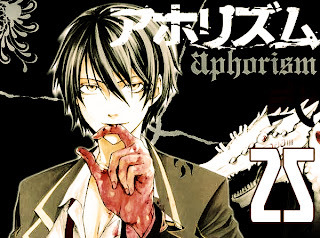 Anyways Aphorism ch 26 coming up next. care to explain to me exactly who it is? wikipedia's entry is difficult to understand. haha. thanks for commenting. Mmm well basically Krishna is a incarnation/avatar of the Hindu headgod Vishnu (like Zeus). A more human-like but still god like (womanizing, but that isn't related too much to the story XD) person. I don't know much about the things he did and all though, I just recognized the name to a god figure xD. So that's how I'm seeing the connection of Krishna protecting Yama who is the "headgod". And maybe thats why he is able to do unfathomable things like give Rokudou another heart or reconnect his limbs and not die... but that's just speculation XD. interesting.....i might include a memo on this in the next chapter. thanks a lot. thanks for all your hard work!!! :D really appreciate everything you guys do! appreciate the comments too, thanks! I love aphorism~ Thanks for translating it! Good day very nice website!! Guy ..